The Architectural Beauty of the Louis Moinet Mecanograph New York Edition (… and that artisan “niche”). The watch industry has had its fair share of “artisan” watches this year. All have been beautiful, all have been meritorious. We can safely say that traditional artisan techniques have been preserved, at least for now anyway. Métiers d’Art timepieces have been so plentiful that they have even been grouped together and have been described, albeit loosely, as a “trend” – a most plebeian term considering the wealth of materials and techniques involved and the uniqueness of the end results. Perhaps “niche” would be a more suitable description with which to label a collection of watch dials on which the work of the artist’s steady hand takes precedence over the indication of time. Artisan dials can also provide a fancy face for a watch which is perhaps lacking in technical prowess – however, this is not the case with the Louis Moinet Mecanograph, which has recently been re-released with new artistic aesthetics. When it was unveiled at Baselworld 2012, the Mecanograph was not the most talked about timepiece of the show, but it was nonetheless, spectacular. It offered a blend of new/old technology with a new take on an historical operating system in which small and large pawls work in unison with the automatic winding gear train. It had precision – a calibre entirely conceived and crafted by Louis Moinet and Concepto, and its aesthetics were stunning, featuring a dial split into two halves, one displaying the entire regulating organ, the other offering the eye-pleasing and distinctive Louis Moinet Côtes du Jura decoration – a motif which has all the charm of a pleated silken skirt. It was perfect really but somehow it was overlooked by many watch publications and did not receive the accolades which it deserved. 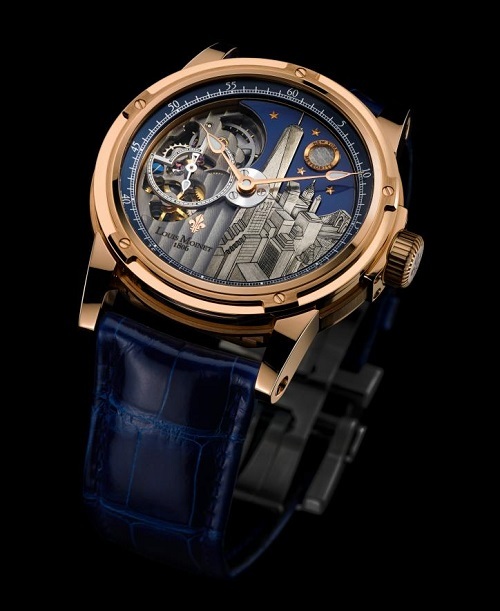 Fast forward to 2014 and at Baselworld this year Louis Moinet unveiled the first models in their Mecanograph City Collection, the pieces did not cause a frenzied reaction among the gathered press and watch enthusiasts, but they did at least provoke a mild hubbub – finally, and rightly so. Two new models have been unveiled the “Doha” and the model which we feature here, the “New York” edition. The LM 31 Calibre can be still be glimpsed on the left of the dial, but on the right some of the most famous landmarks of the New York skyline have been replicated in miniature. The effect is magnificent – from some angles it is slightly reminiscent of an architectural line-drawing, but the pronounced embossing adds a 3D aspect. Particular attention has been given to creating contrasting surface finishes and as this piece catches the light the metallic sheen makes for a highly original watch dial. Louis Moinet have shrouded the technique used to produce the scene in a veil of secrecy, only saying that 20 hours of painstaking work is devoted to each piece. As a final flourish, a fragment of meteorite has been enclosed within a little aperture to represent the moon which casts its silvery light upon the city while it sleeps. With the new City edition of their Mecanograph, Louis Moinet have outdone themselves, it is quite simply a masterpiece – but then, so was the original. The Mecanograph New York edition will be limited to 60 pieces with titanium case, and 60 pieces with rose gold case. The El Primero - Lipped and Tongued c/o The Rolling Stones.